Whole house console humidifiers are ideal for providing moisture to large, dry areas and multiple rooms in your home or office. Why Should You Use A Humidifier? There are three types of whole-house humidifiers: which one is right for you? 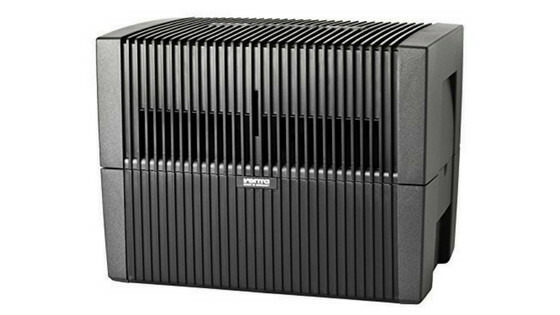 After considering 30 units, we think the Aprilaire Model 500 Humidifier is the best for an average house. It performs well, it has a reasonable price, it has just every feature you could want from the top-rated humidifier. Here is a short overview of the best whole house humidifiers on the market. One of the biggest problems a household can face throughout the year is having low humidity. The level of humidity increases the risk of flu, colds or other infections and also reduces causing discomfort. To counteract these issues in your home, the most logical step you can do is to get a humidifier. A small humidifier if you need to increase the moisture level in a single room, or whole house humidifier to increase the moisture in all areas of your home. Setting up a whole house humidifier correctly can provide you multiple health benefits as well as longevity of your properties. Having a device which replaces the moisture in the air will reduce dust, static electricity and even the symptoms of a cold or flu. Dry, scratchy throats and coughs feel much better with a lot of moisture in the air. When it comes to choosing the best whole house humidifier, you have many choices. 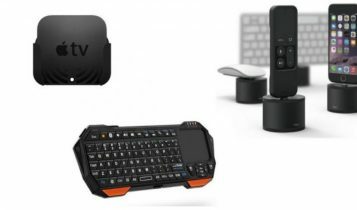 Here are some of the considerations you should keep in mind while shopping for one. OPERATING AREA – Humidifiers are designed to raise the level of moisture in the air, but the effectivity of the unit depends on the size of the space where they are operating. 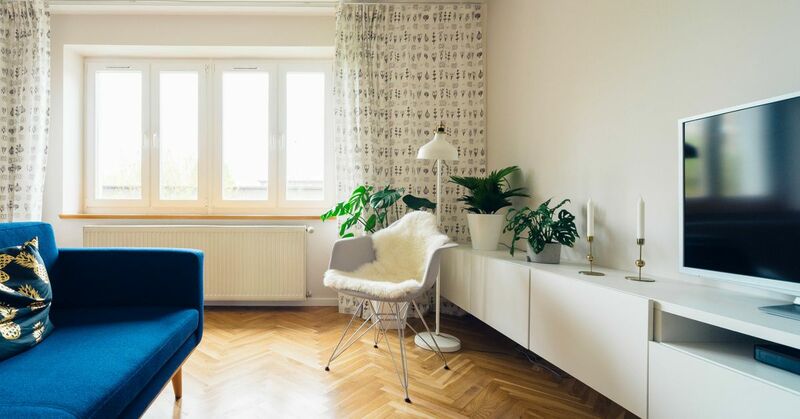 Place one in a too large room and it may not be able to produce enough vapor to keep it at the right humidity, but in a too small space, a humidifier could make too much, increasing the risk of mold or just making it uncomfortable. To determine the humidifier size you need, measure the square footage of the room where you want it. SIZE – Home humidifiers come in a variety of sizes to suit building´s needs. Each device is rated for an area of coverage in square feet (meters) or by estimated room size. The output of unit capacity is measured in gallons (liters) of moisture per day. 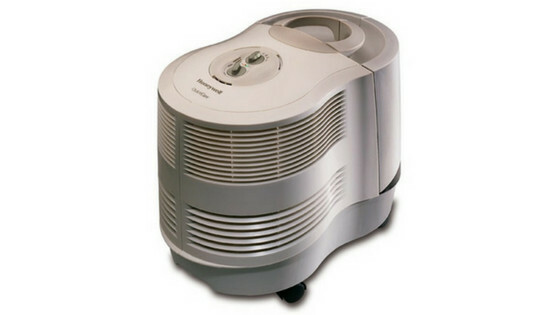 Tabletop (room) humidifiers are great for a single room. These portable devices are lightweight, can be moved with ease and features removable water containers to simplify the cleaning process. Console humidifiers are designed for multiple rooms or entire house up to 3,000 square feet. These machines are also portable, but are heavier and can´t be moved so easy. They are often placed on the floor in a centralized location. Whole house humidifier works with the heating and cooling system of your home and can cover more than 3,000 square feet. PRICE – Smaller console types or portable humidifiers are often cheaper than the types of humidifiers you need to install. You can lower the price of these install types by doing the installation by yourself. WARRANTY – Always, ALWAYS check the warranty of the humidifier. Some units may void the warranty if the device is not installed by a licensed technician. WARM VS. COOL MIST – Warm-mist and cool-mist humidifiers are almost equally effective in humidifying the air. A warm mist humidifier boils water until it produces steam. After then pushes the steam through your whole home. The absence of an internal fan makes these types exceptionally quiet to operate. Unfortunately, they are not effective for large rooms, need often cleaning and hot water or steam can burn a child if he/she is too close. Cool mist humidifiers are using an internal wick filter to absorb water while a fan blows the air through the filter. This is forcing the water to evaporate throughout the room as an ultra-fine, invisible mist. Cool mist humidifiers are ideal for large areas or entire house and parents prefer to avoid hot water accidents in children´s rooms. The only significant drawback is the noise. OVERFLOW PROTECTION – This clever feature automatically turns the unit off when the water level in the reservoir drops too low or gets too high. This help keep the humidifier from overheating and stops the tank from overflowing. A great feature if you are looking for a whole-home humidifier. AUTOMATIC SETTINGS – You should always prefer a model that is offering automatic settings. These units will monitor your house for dry spots and produce steam on those dryness levels or on the temperature of the house. Keeping these factors in mind, we have compiled a list of the best whole house humidifiers. Pick the one that suits your situation best. The Vornado Evap40 is the ideal unit for people who prefer and understand the principle of evaporative humidification. This popular humidifier is good for homes with 1000 square feet area and with a huge 4-gallon tank, adjustable humidistat and excellent all-around Vortex humidification, it gives you good performance for an incredibly affordable price. It is true that Evap40 has not any supreme functions, but the easy-to-fill airlocked water tank and adjustable humidistat gives you an ideal control of the moisture level in your house. 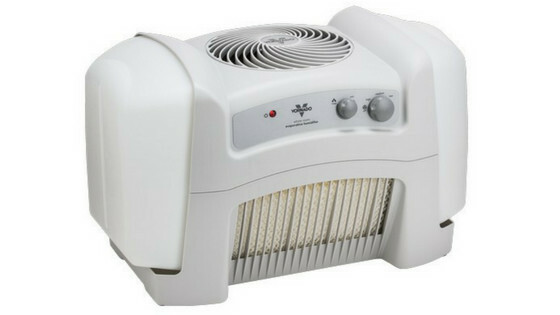 Overall, Vornado Evap40 is a decent starter humidifier for people who require an easily affordable unit. The Honeywell HCM-6009 is a top-rated multi-room humidifier for beginners which is able to cover large square footage with ease. This unit is designed for areas up to 2300 square feet and offers an adjustable moisture control settings, options for numerous outputs and twin tanks for easy filling. The HCM-6009 is built with QuietCare technology that helps lower operating noise and makes the unit up to 30% quieter compared to other tower model humidifiers. Simply put, the Honeywell QuietCare HCM-6009 is a multi-room humidifier efficient enough to provide cool mist for up to 24 hours with a single filling. With all these features, it is a decent humidifier for a beginner at an affordable price. NOTE: The low and medium levels are quit but the level high is notably louder. A solid addition to the home that is capable of controlling the air humidity in a house of up to 2,400 square feet – Aircare EP9 800. An evaporative humidifier which is offering the user a digital thermostat with 9 fan settings, as well as a 3.5-gallon tank (up to 60 hours between refills), all that to keep your home at optimum humidity levels. The way this model works is by moving air through a wet wick filter and putting that moist air back into indoor´s air. Although the Aircare EP9 800 is a heavy humidifier, the device is easy to move from one room to another with its castor wheels. When you consider the occasional filter changing and keeping the tank full, this humidifier requires very little maintenance from users. NOTE: The model also includes an automatic shut-off function. It will turn itself off when it is out of water or when the air in your home has reached the required humidity level. Another Essick Air’s humidifier on our list, Aircare MA1201, is a console-style evaporative humidifier that can provide ideal humidity to a whole house. This model comes with the ability to cover an area up to 3,600 square feet and 3,6-gallon water tank enabling the machine to run for about 36 hours. You may also control the humidifier at 4 fan speeds, it is even equipped with the night time speed setting. This is helpful if you have kids at home who need to get into the bed early. Altogether, MA1201 is a lightweight console type of humidifier (simply plug it in and turn it on), with long operation time and an automatic shut-off that doesn’t need much adjustment and works as claimed. 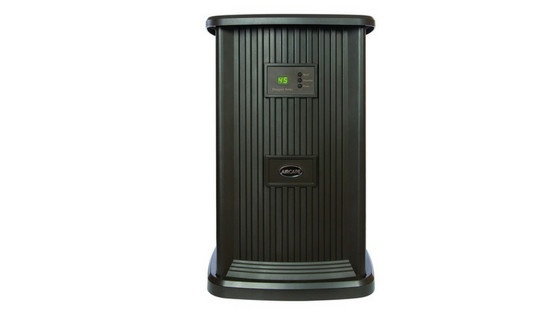 NOTE: This evaporative humidifier is highly rated and accepted by users, making it one of our greater recommendations. Its vintage look might remind you of the console stereo or TV your parents had when you are young, but inside of this console-style evaporative humidifiers is a strong and effective machine. It has a large water capacity (5.6 gallons) that can operate up to 45 hours non-stop and cover area of 3,600 square feet, 9 fan speeds for managing moisture level and digital humidistat which sits on the outside of the console, showing you the important stats (selected humidity level, current level and speed of the fan). 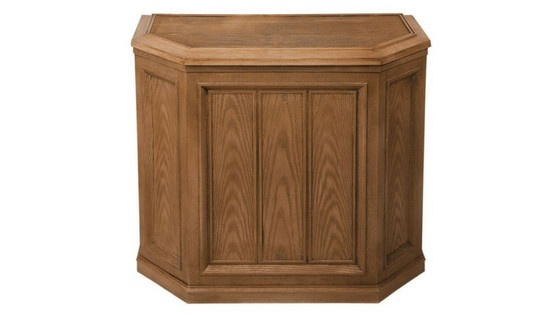 MORE: This console humidifier, which comes in a light oak finish, is ETL approved. The ETL Mark is proof of product compliance to North American safety standards. It means that the product has been independently tested and meets the applicable published standard. 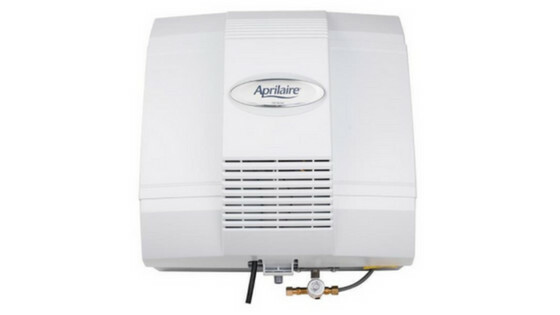 The Aprilaire Model 500 is ideal for smaller homes (up to 3,000 square feet), requires fewer installation parts, and needs only basic annual maintenance. As with the other Aprilaire models we listed in this article, you will get fully automatic digital controls, a bypass damper, and an outdoor sensor. That’s a lot of features for the price, making it one of the best whole house humidifiers on the market. 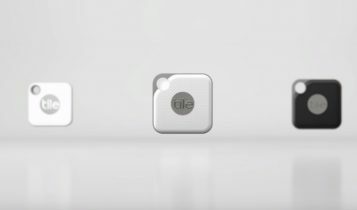 To make it clear, two Aprilaire 500 models are available. Model 500 has a digital humidity controller supporting both automatic operation and manual control. Model 500M comes only with a manual humidity controller. NOTE: Aprilaire’s products must be installed by a licensed HVAC technician in order to ensure that the warranty is valid. Another whole-home solution which is helping homeowners reach the optimal indoor humidity is called Aprilaire 400. This evaporative humidifier is designed to work in up to 4,000 square feet area and have to be mounted directly into your cooling and heating system. The Aprilaire 400 increases the water´s temperature and turns it into the stream. With an evaporating rate of 0,7 gallons of water/hour, it pumps out this stream to make your house a healthier place. Generally, this is an efficient, high capacity, water conserving, a drainless model that is using the evaporating technology to reduce the water used to humidify the air in your home. NOTE: The Aprilaire 400 doesn’t need too much maintenance – you should check the filter only every 500 hours. 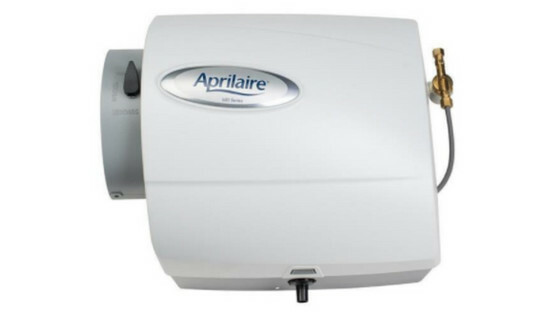 Are you looking for a high-quality system that is able to humidify even the largest homes, then Aprilaire 700 should be the right for you. This model covers up to 4,200 square feet and delivers up to 50% more moisture than some similar machines on today´s market. This means you are saving more energy by not needing to run the unit as often. With the evaporation rate of 0,75 gallons per hour, you get a humidifier with one of the highest capacity on the market. Strong, effective, yet still quiet. The Aprilaire 700 offers suitable programs including whisper (great for a night), medium or high level. 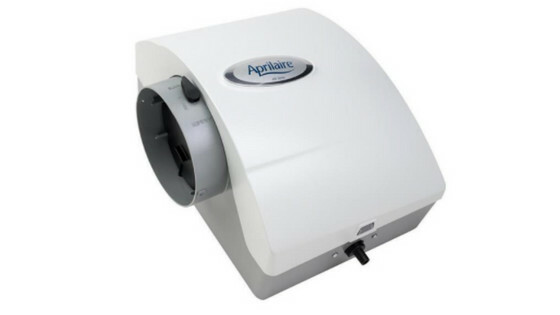 NOTE: The Aprilaire 700 Humidifier has been designed to use hot, cold, distilled or hard water. All these water do not have any significant effect on the machine. Capable of control humidity levels while eliminating impurities from the air, the Venta LW45 is a good option for households where are people suffering from allergies. 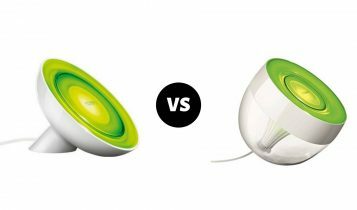 Its 2-in-1 design is a combination of a humidifier and air washer. That means you get an evaporative humidifier that is able to remove large airborne particles from the air in one single unit. The machine also works without the need for cartridges, pads, or filters. The unique yet simple technology is designed for any space up to 800 square feet, provides an ultra-quiet 3-speed drive and is so well made that the manufacturer gets you 10-year warranty if installed correctly. 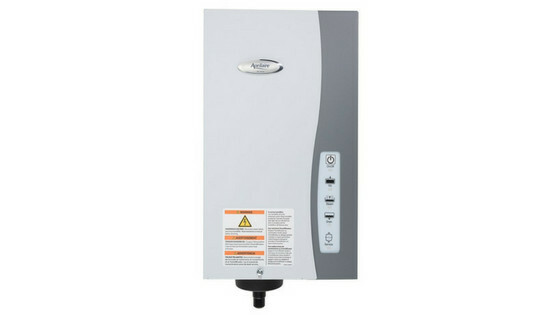 Aprilaire 800 is a steam humidifier with the highest operating range on our top 10 list – and the most expensive unit. It covers up to 6,200 square feet and can produce almost 34.6 gallons of water per day. This 100% automatic model is using the latest absorption and dispersion steam technology to pump the steam into your ducts to humidify a whole house. This model comes with an Aprilaire62 advanced humidistat that will automatically adjust the humidity delivered to your house based on temperatures outside. Why choose Aprilaire 800? Although this model is expensive, you get a fully automatic highly effective steam humidifier covering even large houses (four-bedroom home) with healthy air. MORE: The maintenance is very simple and usually takes one step. After notification, you need to replace the Aprilaire 80 Canister. It is also recommended for cleaning the machine every 500 hours of use. The humidifier is a device that keeps the atmosphere in your house moist. It can increase the air humidity of a single room or the entire house. When used correctly, humidifiers can help to alleviate dry skin, chapped lips, nose bleeds, and other pesky cold-weather conditions. It can even help to reduce some snoring! Generally speaking, humidifiers do more good than bad, as long as you clean them properly. Without regular care, a dirty humidifier could promote bacteria and mold growth. Perhaps the best way to find out which humidifier is the right for your needs is to contact an expert who can decide which kind of conditions you home offers. But if you don’t need to call an expert, here are a few important things to consider. OPERATING AREA – As we said before, humidifiers are designed to raise the level of moisture in the air, but the effectivity of the unit depends on the size of the space where they are operating. 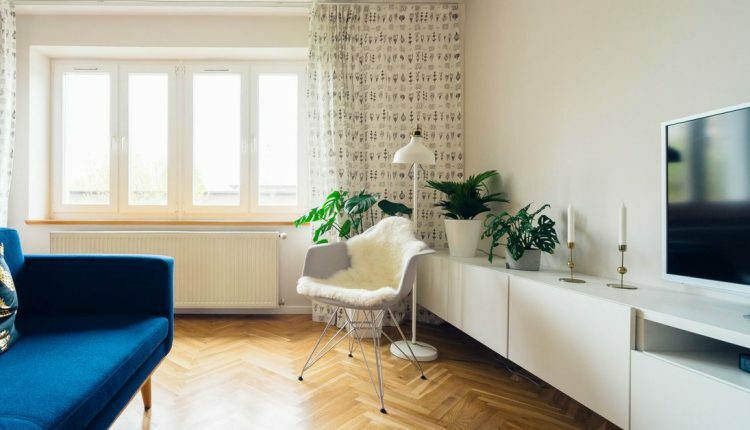 Place one in a too large room and it may not be able to produce enough vapor to keep it at the right humidity, but in too a small space, a humidifier could make much, increasing the risk of mold or just making it uncomfortable. To determine the humidifier size you need, measure the square footage of the room where you want it. You should also keep in the mind the tank size and moisture output capacity while buying a home humidifier. Do you want to refill it daily (portable/room), every few days (console) or not at all (whole house)? Keeping balanced indoor humidity throughout the whole year is an important part of the healthy and comfortable environment. According to some researchers, the ideal humidity level in the room or building is between 30% and 50%. Low humidity causes static electricity, dry skin and hair, increased susceptibility to colds and respiratory illness and can allow viruses and germs to thrive. Wood floors, furniture, and millwork will split and crack, the paint will chip, and electronics can be damaged because of low humidity levels. High humidity fosters the growth of bacteria, dust mites, mold, and other symptom-aggravating allergens. In addition, this kind of damp and muggy environment may develop an unpleasant, musty odor and cause wood to rot, walls to stain, and paint to peel. Installing a properly working humidifier in your home has many benefits. The increased moisture (30-60% air humidity) help you reduce health complication and increases pleasure and comfort. What are other benefits? The wick filters have to be changed in a certain interval. Buying a whole home humidifier is without a question a huge investment. Unfortunately, unlike portable humidifiers, this type of humidifier has to be installed in your home and require some effort and time to set up and run. Therefore you should consider which type of whole house humidifiers is the best for you because you want to benefit from the healthy level of air humidity in your house. Yes, well working humidifier helps reduce air allergens, decrease a change of catching flu or colds, and is able to extend the life of hardwood flooring, furnishings, and everything else in your house by maintaining the air at the ideal level of humidity – 30-50%. Every whole house humidifier is (typically) attached to your present central heating and air conditioning system. They regulate the humidity in your home and automatically add moisture to the system when your furnace or air conditioner kicks on. The main difference between them? They differ only in how they introduce that moisture to the system. 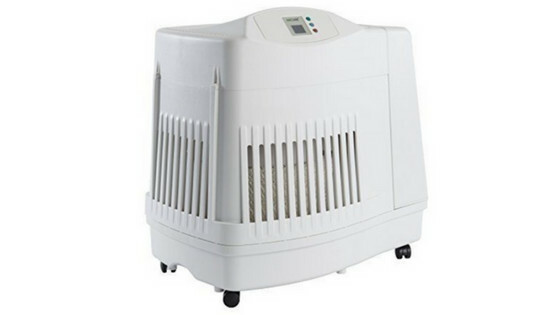 The primary types of whole house humidifiers are Bypass, Fan-powered, and Steam. BYPASS HUMIDIFIERS – Also called flow through (or evaporative/pad type) humidifiers, they can be installed easily to your water supply line. They use a furnace to add moisture to the warm air in your home. Simply put, they pull warm air from ducts, then processing that air through a humidity-generating system known as a water panel. After that, the air is pumped back into the ductwork, where it will circulate through your home. People are buying Bypass humidifiers because of they can be easily and quickly installed and offering a good air quality for a reasonable price. FAN-POWERED HUMIDIFIERS – Basically a bypass system, with a few additions and upgrades. The powered fan assists the evaporation and circulation, so the humidifier can produce more moisture much quicker than bypass systems. The main drawback is that the fan-powered humidifier requires more energy to run, and more maintenance on average. STEAM HUMIDIFIERS – Steam (mist) humidifier operates independently of your furnace system (unlike the fan-powered and bypass types). How do they work? The internal heating element raises the water temperature in a reservoir electrically until it boils to create humidity in the form of steam. Steam humidifiers are the fastest and most efficient method of increasing and maintaining the level of humidity in your home, but of course is the most costly device to install and maintain as well.